Working with Nelson Nygaard, TND Planning, and DC Office of Planning Staff, Urban Advisors helped in developing a typology of 35 Metro Station Areas. Urban Advisors has been developing analysis tools for understanding the potential of places to change under the formative effects of planning. Looking at 35 station areas, we used GIS analysis to identify the capacity of station areas for new development based on existing zoning. The analysis first identified how much land was either vacant, or under-improved. Under-improvement was evaluated based on the projected value of total build-out of each tax parcel under current zoning, compared with the actual tax assessments. This removed the price of land from the analysis, which eliminated factors such as neighborhood and locational values allowing us to compare different neighborhoods around the city. Next, the net capacity for development under the same categories of existing improvement value were calculated to understand the capacity for new development in the station areas. This innovative analysis technique is proving useful in helping policy makers classify Station Areas by existing potential and land utilization, so that appropriate policy tools and zoning can be applied to shape the vision for each area. Our team, led by Ferrell Madden Lewis, was charged with developing a Form Based Code for downtown Overland Park and two neighborhood nodes. 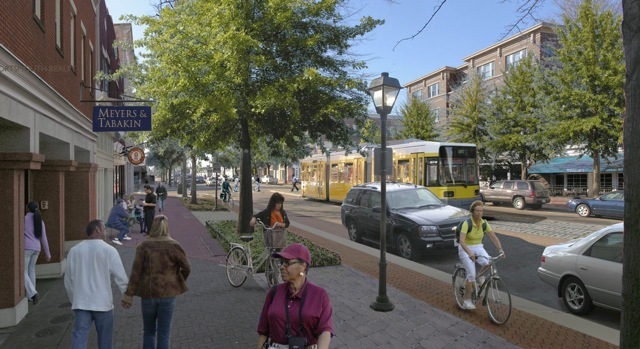 This project implemented the Vision Metcalf corridor plan, promising a new direction for the City, championing sustainability, walkability and pedestrian places. After assisting with the balance of supportable land uses at each node, we worked with the design team to evaluate the feasibility of proposed site plans based on a typical lot size for each district, parking configurations and financial analysis. Using GIS analysis of land and building values, we then described the potential economic impact of redevelopment under the new code. One of the design ideas included creating a new street where land is now mostly vacant. Pro-forma analysis of redevelopment scenarios for this site demonstrated the importance this infrastructure improvement could have for the downtown as a catalyst project. Michigan City retained Economic Visions, TND Planning Group, and Urban Advisors to evaluate the economic development potential around three alternative commuter rail stations. The commuter line is required to make safety changes to its track, opening the opportunity to relocate the line and build a new station and with it transit oriented development. Our team was asked to comment on three alternative alignments and determine the potential economic impacts of each for the downtown. Our conclusions outlined the potential economic benefits of each location, while acknowledging the political and implementation constraints. This study succeeded in building consensus for choosing an alignment, and at the final presentation the regional rail authority publicly announced support for the recommended station area configuration and development. Assisting PlaceMakers, Urban Advisors provided an economic analysis and development strategy for historic Downtown San Marcos. This project provided the implementation strategy for the recent Downtown San Marcos Masterplan. Our research evaluated regional projections and coordinated in implementing the Regional Growth Concept, with goals to absorb growth in San Marcos within a one mile radius. By quantifying growth pressures, we developed a program of uses for housing, employment and retail that guided the design team. Our recommendations included goals for employment centers and target industries as well as potential retail categories. A list of requirements for successful implementation enumerated issues that needed to be addressed and suggested resolutions. Working with TND Planning Group and Seth Harry & Associates, Urban Advisors provided market and economic impact analysis for the Highlandtown-Greektown Transit Oriented Development charrette and plan. The goal of this analysis was to determine how the public investment of the planned Red Line light rail stop could help revive a traditional commercial corridor. Our analysis coordinated with the station area design and public improvements to describe how the transit stop was positioned to capture new development of working class professionals and new employment uses that would help support the corridor. With an existing retail base, highway access, an adjacent Johns Hopkins medical campus, large and underutilized sites, and a planned light rail stop, the location has the potential to be an economic engine for the City as well as revitalize the neighborhood. Our conclusions outlined goals and requirements for successful redevelopment and strategies for improving business conditions and support for the corridor. The impact analysis quantifying the potential redevelopment value is now a tool for the community to use in advocating for the implementation of the plan and funding for the Light Rail. Concurrent with a downtown master planning effort, our team was selected to develop a plan and form based code for an adjacent industrial corridor. Working with Ferrell Madden Lewis and Rhodeside and Harwell through a week long charrette process, we determined that to help downtown succeed, this neighborhood needed to be infilled with new residential uses. We assisted the City with balancing a program of supportable uses, recognizing that the majority of retail and entertainment would be concentrated in the historic downtown. Using GIS analysis to evaluate the redevelopment potential of the area, we quantified the amount of underutilized land ready for reinvestment. By working with the design team in an iterative process, we refined the proposed building scale to feasible designs based on typical lot size, access, parking and financial analysis. This identified the need for a parking strategy, and identified alternate locations and funding mechanisms for City owned lots that would enable adjacent development. At the same time, we made recommendations for the timing and location of public buildings and infrastructure investments as part of a development strategy to stimulate and protect private investments in the neighborhood. Before the end of the charrette, the redevelopment authority was negotiating for key parcels of land and the Form Based Code was adopted immediately upon completion. This project was a 2010 APA Virginia Award winner. Urban Advisors worked on a team with Dover Kohl & Partners to develop a master plan and form based code for Fairfax Boulevard. Through a charrette process we determined that the goals of the project were to preserve the business viability, improve quality of life for residents and ensure a tax base for services. The plan that emerged concentrated development at three nodes along the highway corridor, where we worked with the design team to propose feasible land use programs, including housing, retail and employment, that would enhance the character of each location. An important component of this project involved showing how places that provide a concentration of amenities are valuable and attractive to businesses and residents. By improving conditions at the designated nodes, the corridor could offer the urban amenities that would capture a wider segment of regional growth, particularly including businesses that would support the tax base. The plan was adopted by city council in 2008. Montgomery Alabama has one of the most historic downtown areas of any city in the United States. Our assignment required understanding and being able to demonstrate how the historic downtown was a potential asset in the marketplace. As part of a team led by Dover Kohl & Partners, Urban Advisors analyzed real estate markets and provided strategies for implementing change in Downtown Montgomery. Our research showed that the city was suffering not from a lack of market support, but from non-market factors requiring a community based economic development strategy to bring new opportunities. Working with the design team and the public,we enumerated the challenges and provided design, implementation and regulatory plans for reaching achievable short and long-term development of housing, retail and office. This was accompanied by specific strategies for each development type, listing supportable square feet of retail categories and office space. Together with Zimmerman Volk Associates, we determined the target market and identified the supportable number of different urban residential products. Financing strategies included identified sources for small businesses, renovation of buildings in the historic district, and neighborhood revitalization. Ken Groves, planning director, notes that of 20 recommended projects, 10 are now being implemented successfully. Working through a two week charrette process, UrbanAdvisors assisted Dover, Kohl & Partners and Hall Planning & Engineering with planning to guide the next 20 years of growth in Fayetteville. UrbanAdvisors researched employment, future demographics and current and past land use densities and patterns to help create an innovative plan that will create a series of new neighborhoods and prevent sprawl. We provided analysis of development scenarios under alternative policies, and were able to graphically and numerically demonstrate the costs and required land for conventional sprawl versus traditional neighborhood patterns. Besides being more cost effective and land efficient the Smart Growth policy recommendations laid the foundation for extending the scale of the existing, historic neighborhoods and commercial districts. The new plan forms a legal framework for the use of form based code citywide. 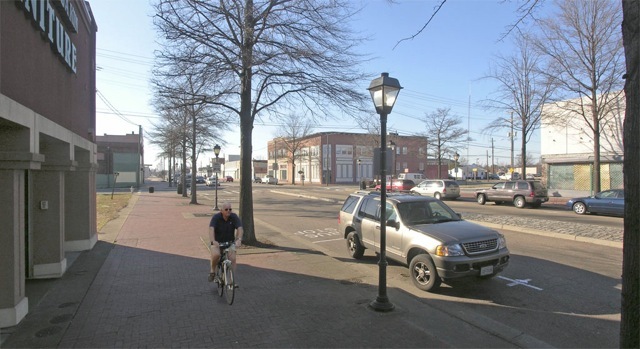 The plan won an award from the Arkansas APA for comprehensive planning, and a 2007 Charter Award from the Congress of the New Urbanism.